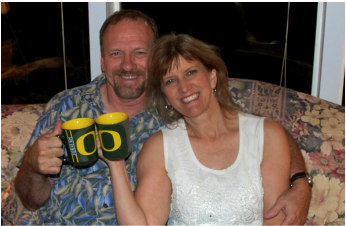 Karen & Terry Hillyer head up XAi (international student ministry) at U of O. Karen has been working with internationals at Georgetown University in Washington D.C. for 13 years and got married to Terry 2 years ago, who is excited to join in befriending internationals. Karen loves learning about cultures, a good cup of tea, and their cute little pup, Tucker! Terry loves watching sports, playing the guitar, and chatting with international friends. If you are an international, you can check out their website at www.oregonxai.com. We welcome international students to attend our Oregon Chi Alpha meetings and also attend our special events for international students. All are welcome! We provide interesting cultural activities, trips, and parties. Students are given the opportunity to participate in the XAi programs of interest to them. Every Friday, we have a fun XAi Friday at the Law School. We have snacks and then have “Life Groups” where we investigate the Bible together in small discussion groups. It is designed for those who don’t know much about the Bible, but are curious. Afterwards we enjoy hanging out with each other and play games or watch a movie. We will meet at 6:30 each Friday (starting in October) at the Law School, room 241.